Speaking of jobs I should be doing – hoovering is something I should do twice a day; what with a husband and son who have no concept of eating over a plate and a dog that sheds hair so rapidly that she should be bald by now. Vacuum cleaners are a tough decision for me – I suffer from back/hip pain and chronic fatigue so I need one that is light, easy to manoeuvre and something that actually picks everything up easily without sucking up the carpet. 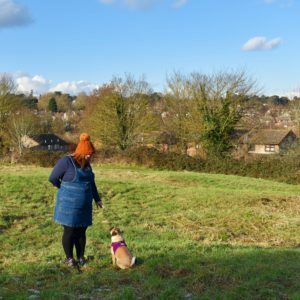 When the lovely people at Vorwerk offered me the chance to review one of their Kobold vacuum cleaners I was intrigued – we have reached a point where I either need to shave the dog or splurge and buy a decent hoover. 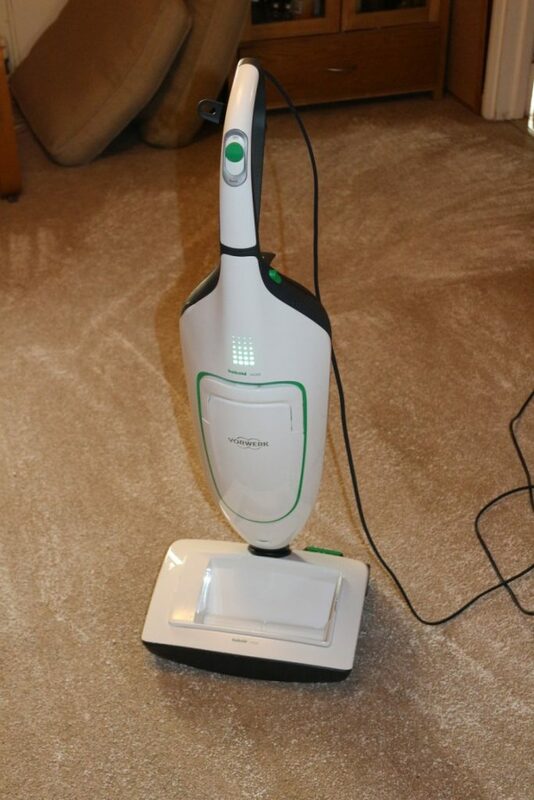 The Vorwerk Kobold is marketed as a homecare system, with the VK200 Upright Vacuum Cleaner part as the main body and the EB400 Automatic Electric Brush AKA the standard vacuum cleaner bit. Vorwerk are a German company who are more commonly known for manufacturing and selling the Thermomix, one of those desired kitchen gadgets that I will probably never afford but will always long for. Boo. My experience of vaccum cleaners are generally that you plug them in and off you go – however the Kobold does so much that it was delivered by a salesman who gave a lengthy demonstration on it’s various uses and parts. I did wonder why a hoover needed demonstration but it is necessary to get the best out of the system. It was delivered in two rather large bags – I was a little put off by the amount of space all the various parts would take up, bearing in mind I live in a small terraced house and I have nowhere to store a Dustbuster let alone this. We’ll start with the VK200 – it is an upright vacuum cleaner(the main part) that on first appearances looks swish and hi-tech, with a white body and green lights. It is a bagged vacuum, which I quite liked as from experience you can lose suction from a bagless vacuum. It isn’t cordless and the cord runs for miles – personally I’d love it to be cordless or at least have a retractable lead. It is nice to use, it manoeuvres well and it the suction is amazing – it is also intelligent and will detect the type of surface you are on and alter the power accordingly. Noise wise it is reasonably quiet – the other parts can be a little noisier but nothing ear-piercing to be honest. For stairs, nooks and crannies you can disconnect the EB400 and attach a hose and the PB440 head, which is my favourite part I have to say. The head has two settings; one for small surfaces and the other for crevices; perfect for skirting boards, the sofa and the stairs. The suction in the tip is incredible, love it. My only negative is that there is no on/off switch on the head – the only switch is on the upright part, a massive design flaw in my opinion. I did find the system a little awkward with the hose attached – you can attach a strap and carry it but when I tested it I was struggling with back pain and it wasn’t easy for me. You can just lay it on the floor but I found it had a tendency to roll over, being an upright it’s not built for laying down. My kitchen has a laminate floor and is a pig to keep clean – I mop it most days and it amazes me how I spend an hour a day sweeping and mopping such a small area. With the Kobold you can attach the SP600, which is a 2-in-1 vacuum and mop for hard floors. You pop a bit of the Koboclean solution in, switch it on and away you go – you can hoover and clean your hard floors at the same time. I loved this function – it turned an hour-long job into ten quick minutes. Amazing. 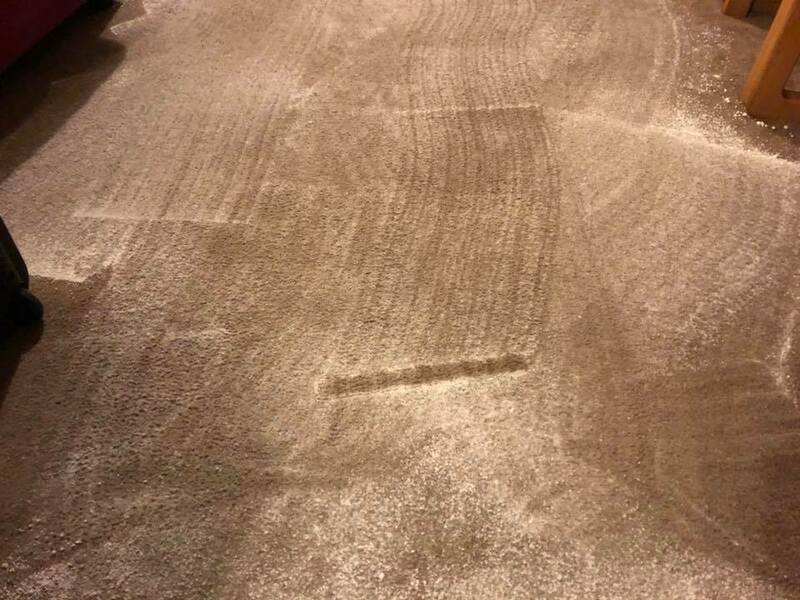 You can also attach the VF200 carpet freshener hopper for dry cleaning – you pop in some Kobosan(it’s like delicious scented snow), run the machine over the bit of carpet you want to clean, leave it for a while and hoover it up. I found the snow spreading a little bulky and awkward but with a little perseverance my carpet now looks and smells fabulous. Another winner. It is an expensive system to buy – to buy the complete system including all accessories it costs £1500 – which is indeed a good price for everything it does but personally would be too expensive for a house my size. You can buy the parts separately; the VK200 upright body costs £449 and the Automatic Electric Brush (EB400) £300 – still a considerable amount of money. The 2-in-1 mop/vacuum (SP600) costs a further £400 and the other parts are around £150 a pop. Being a bagged system the bags come in packs of six and cost £18. The Koboclean for the mop/vacuum costs £7 and a little does indeed go a long way. The Kobosan dry cleaning snow costs £25 for 5 sachets and I used two bags on my front room carpet – it is a good product and well worth the price. Regardless of which package you opt for the system is guaranteed for five years. Is it a good vacuum cleaner? Yes, it is amazing and I loved using it; however the cost is a huge issue for me with the size of my house and our income; if this wasn’t the case I would more than likely buy the whole kit. For more information on the VK200 click here, the EB400 click here and you can find Vorwerk on Twitter, Instagram and Facebook. Clingy at 3: another phase?